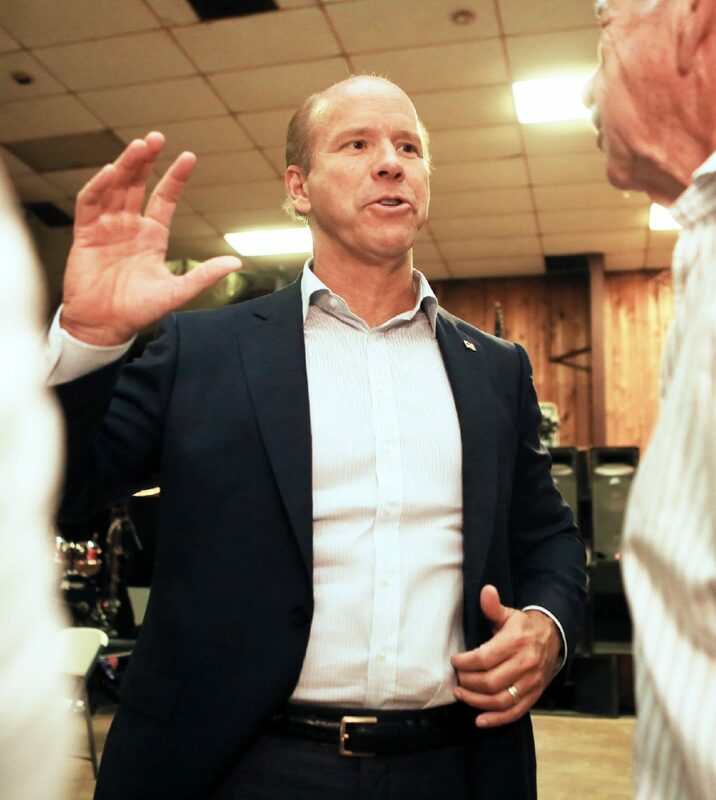 Presidential candidate John Delaney, D-Md, speaks with attendees as he campaigns at VFW 10802 on Friday, Oct. 5, 2018, in Donna. BROWNSVILLE — The chauffeur unlocked the passenger door to his minivan, and the only person to so far announce a 2020 presidential bid walked toward a restaurant next to a night club and a smoking lounge. U.S. Rep. John Delaney, D-Md., gathered himself for the inaugural border soapbox, a stage that may become familiar to other Democrats eyeing the White House. The midterms were still a month away, yet more than 100 people were about to pack Mi Pueblito to hear Delaney’s own immigrant story involving a different border than this one. But first, he wanted to eat. “Do you have quesadillas?” Delaney asked the waiter. 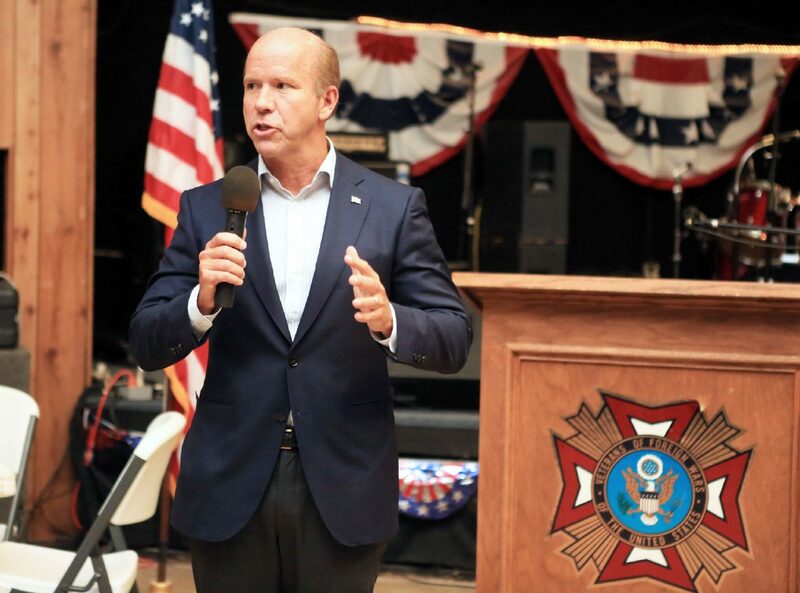 Presidential candidate John Delaney, D-Md, gives a speech as he campaigns at VFW 10802 on Friday, Oct. 5, 2018, in Donna. 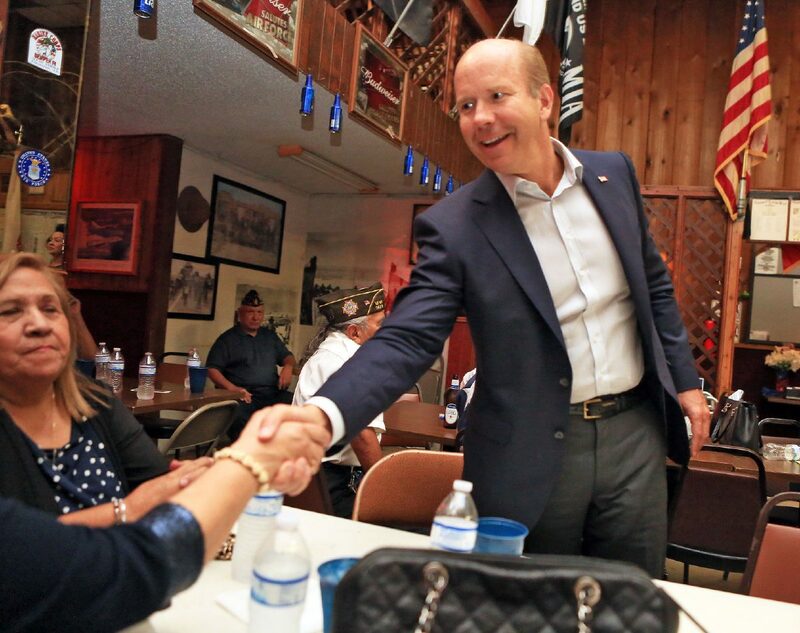 Presidential candidate John Delaney, D-Md, spaeks with attendees as he campaigns at VFW 10802 on Friday, Oct. 5, 2018, in Donna. 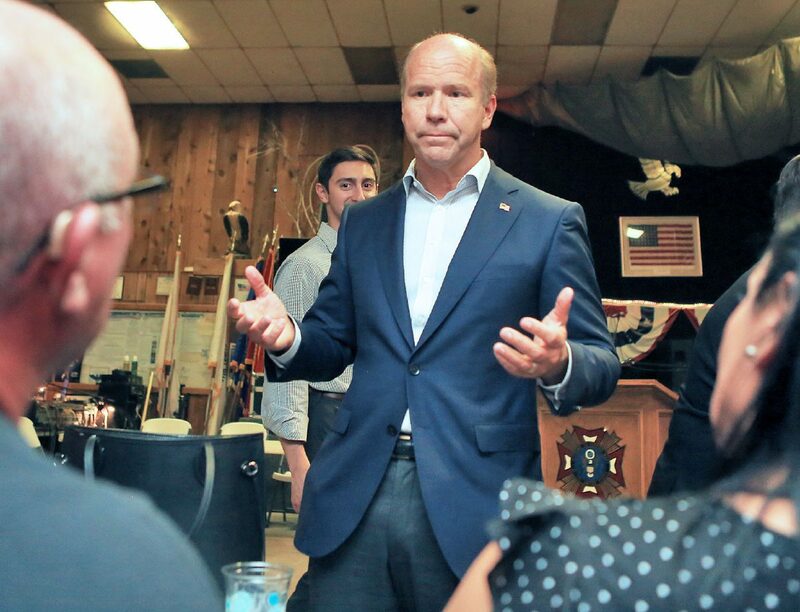 Presidential candidate John Delaney, D-Md, talks with attendees as he campaigns at VFW 10802 on Friday, Oct. 5, 2018, in Donna. 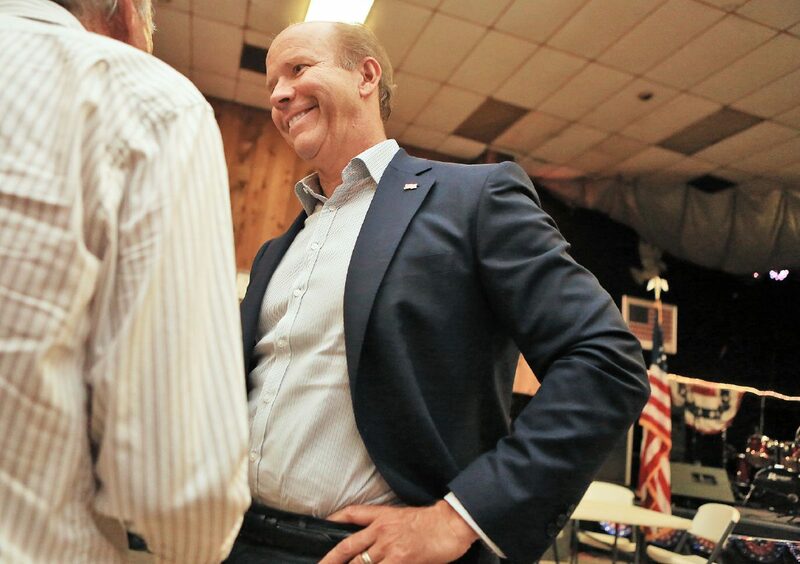 Presidential candidate John Delaney, D-Md, shakes hands with attendees as he campaigns at VFW 10802 on Friday, Oct. 5, 2018, in Donna. The server pointed at the menu. Perhaps something else. Quesadillas are more popular elsewhere in the United States, but not a common request in the Rio Grande Valley. He didn’t know. Why would he? No Democrat currently considering a presidential run has spent much time here, the region most affected by two of President Donald Trump’s top campaign promises in 2016. Enchilada plates were distributed and the crowd was about to file in, thanks to Delaney’s friend and chauffeur, U.S. Rep. Filemon Vela, D-Brownsville. Delaney’s border education was just beginning. Vela and his Valley colleague, U.S. Rep. Vicente Gonzalez, D-McAllen, have recognized the region’s importance. Free trade has transformed South Texas, but Trump’s trade policies and threats have left the industry here uncertain about the future. The president has also hammered the border for a lack of security and immigrants streaming into the country, promising to build a wall between the two countries. Over the summer, politicians swarmed to the border following Trump’s policy to separate immigrant families upon illegally crossing into the country. Many of these families were split up by federal law enforcement at a U.S. Border Patrol facility in McAllen. Most of these visiting members of Congress hadn’t signaled 2020 bids, though a couple have since. U.S. Sen. Jeff Merkley, D-Ore., was the first senator to make a splash when families were being separated. Merkley live streamed his trip to a Brownsville youth migrant shelter in June, one where many separated children were being housed. Merkley was denied access, so he attempted to be a leading voice on immigration following his visit. Since June, Merkley has made trips to early presidential primary and caucus states, including Iowa. Sen. Cory Booker, D-N.J., visited by himself a couple weeks after Merkley, in the middle of a flurry of congressional trips. Booker observed proceedings in McAllen’s federal courthouse and toured the south McAllen Border Patrol facility where families were separated. Vela and Gonzalez plan to host everyone genuinely considering a presidential run. Vela has made contact with people close to Booker, Los Angeles Mayor Eric Garcetti and Virginia Gov. Terry McAuliffe, he said. Kamala Harris is also on their radar. Vela and Gonzalez are hoping for another presidential prospect to visit before year’s end. By next fall, the Valley congressmen expect to have hosted every serious Democratic candidate. Not every visit will be like Delaney’s, Vela said. Though his might be tough to top. After telling the Brownsville crowd about his grandparents migrating from Ireland and England, about him being the first in his family to graduate from college and about starting two companies, taking them public and being the youngest CEO in the history of the New York Stock Exchange, Delaney was shuttled west to Gonzalez’s district. They met Gonzalez at the humanitarian respite center in downtown McAllen next to the federal courthouse, the same one Booker visited. Hundreds of immigrants pass through the respite center every day. “Oh my gosh, look at this,” Delaney said when he entered the packed respite center full of Central American immigrants. The tour of the small space took the three congressmen out back by the large trailer with showers inside. An immigrant laid down cardboard and a full grocery bag on one end. He took off his shoes, laid down and rested his head on the bag. It was the only spot he could find to rest. “There aren’t always people sleeping under trailers here, right?” Vela said. Inside, Delaney and Gonzalez chatted with volunteers before noticing a large map on the wall. Gonzalez has made multiple trips to Central America recently, where the deep problems motivate immigrants to make the journey north. They talked about Mexico’s southern border with Guatemala, and how they could fix it. For now, though, hundreds of migrants sat in this downtown McAllen building. When they’re apprehended by law enforcement, immigrants are brought to the processing center in South McAllen, the same place 2,500 families were separated several months ago. Many families are then dropped off downtown and stay at the respite center for several hours — sometimes a day — before boarding a bus at the nearby bus station to live with family elsewhere in the U.S. as they seek asylum. Delaney couldn’t believe it. He asked a worker if anyone ever buys meals for the immigrants. So before exploring the local medical school, Vela stopped at Little Caesar’s and Delaney bought 60 pizzas for the respite center. The next stop was at the University of Texas Rio Grande Valley’s new School of Medicine. Delaney was impressed with the buildings, with the school’s brass detailing a brief history and with the two medical students he met. One was from the Valley, and upon receiving her degree, plans to stay here. The congressmen concluded their day at the VFW in Donna. The open, dimly lit hall was full of beer, barbecue and veterans. Gonzalez and Vela received warm welcomes. Delaney waived, but he hadn’t spoken yet. No one knew who he was. Before the event began, Delaney made his way around to each table. Many engaged, some weren’t as interested. A table of retirees in the back turned toward the tall man who looked like he was not from here.